But first coffee. Yes I am actually drinking coffee as I write this post, relying on caffeine to extract whatever creative juice left on my right brain. I guess it’s one of those days, mental constipation that is! Let’s see if eye shadows can render provisional remedy. 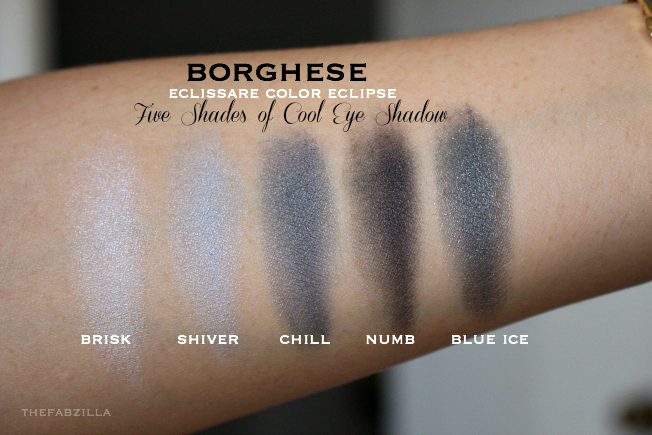 So let’s get our hands on Italian brand Borghese Eclissare Color Eclipse Eye Shadow Five Shades of Cool (blue) and Five Shades of Fresh (earthy green). These bellas feature monochromatic shades in varying finish and retail for $29 each. They’re about the size of my palm, housed in magnetic cardboard-type packaging, and has decent-sized mirror to boot. These eye shadows are easy to apply, blend and work with. They are moderately-pigmented if applied dry so if you want vibrant intensity, go wet or go home. Now we’re talking! Applied over an eye primer, average wear time is six hours with minimal fading, granting you don’t do anything intensive. I say so because they did crease and melt after an hour of hiphop dance and treadmill. I know I should’ve remove but sometimes that’s how zilla roll, raccoon eyes and all. 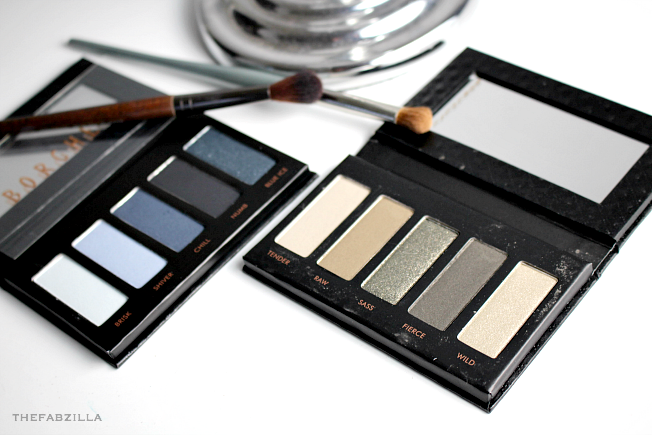 Five Shades of Fresh Eye Shadow is ideal for daytime smokey eyes. Sass is my favorite, it’s a pearlized khaki green which flatters my brown eyes (and hazel contacts). Tender is satin pale khaki, Raw is satin olive-brown, Fierce is semi-matte dark olive, Wild is pale khaki with gold flecks. 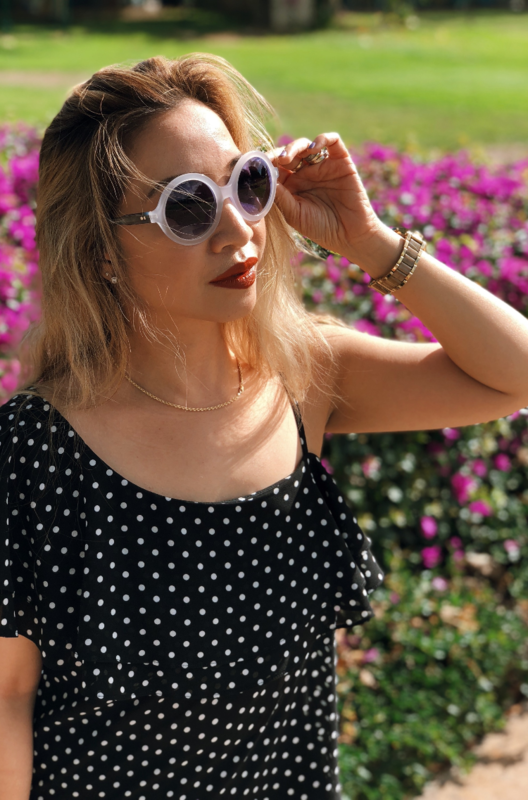 Five Shades of Cool is neat if you’re feeling more fancy or party-ready. My personal favorite is Blue Ice, a shimmery dark blue shade. Brisk is palest blue in satin finish, Shiver is matte baby blue, Chill is satin dark blue, Numb is matte navy-black. 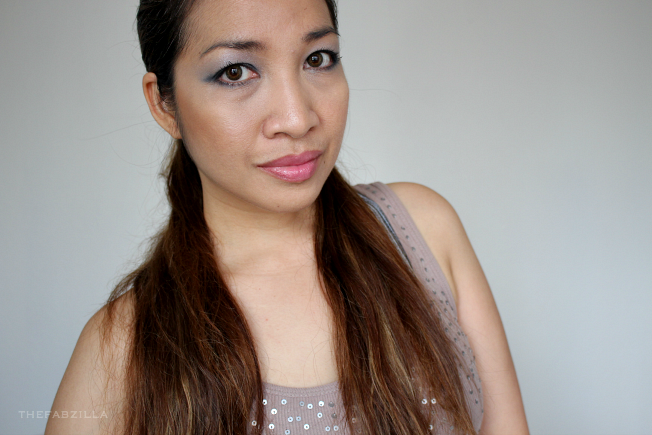 You’ve seen my neutral eye makeup countless times on the blog so allow moi to look fancier today. 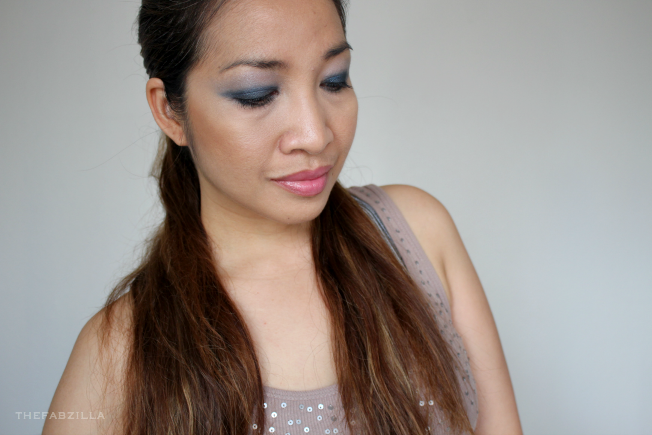 I used Blue Ice (wet) on lids, Shiver on crease, Chill on lower lash line. Are you feeling fancy today? wear blue eye makeup! Wowza, twinsy– that is a gorgeous look on you! LOVE IT! I love the Five Shades of Fresh palette – I'm naturally drawn to those colors anyway. (Let's not talk about how many eyeshadows I have in these colors, hmmm???) I love your look, though I couldn't pull it off! I just got these in the mail the other day and I'm planning on testing them out this week! I'm glad you were able to create a pretty look with the blue, has me excited! Very pretty shades. I love the color on your lids. 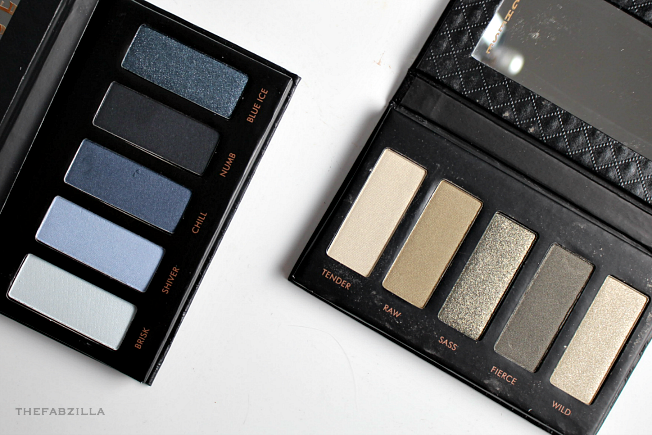 Both palettes look very pretty. Love the eye look you put together and your tank is adorable! Gorgeous swatches! I love the deep blue on you. Blue Ice looks utterly gorgeous and I love your EOTD! I tend to hit the treadmill with makeup on as well because I forget to take it off first LOL. I love your eye makeup, it looks fantastic with your complexion! Smokin! I love the Fresh palette. Great colors. I haven't used Borghese in a zillion years. This looks so nice on you. I wonder who carries the brand near me. I've not tried these shadows – and traditional blues, on me, make me look like I've got a black eye. I need to experiment with them more. Great shades! I thought I liked the Fresh shades better, but that blue is amazing on you. OOOOOOH….. the blues on you – girl, they are gorgeous. 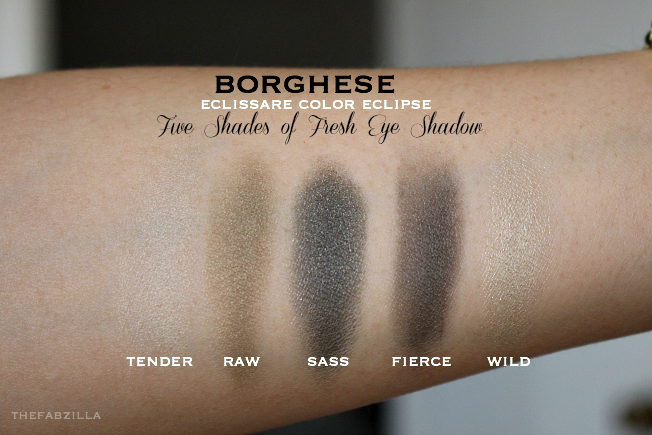 I love the smoky palette and neutral palette I have but man, aren't these shades really nice. Blue Ice is my favorite! I LOVE 5 Shades of Fresh! OMG it's SO pretty! I love your eye look, too!